Priced: $139.95 - $140.00 Rated: - 4 stars out of 5 by 7 reviews. A standout among control running shoes, the Brooks Beast running shoe, like its sister shoe, the Brooks Ariel for women, boasts a growing number of fiercely loyal fans who swear by its performance. Sporting a breathable Element Mesh™ upper, this men's running shoe combines maximum support and long-lasting comfort built upon a reliable, motion-control platform. The full-length Caterpillar Crash Pad delivers flexibility; a midsole stability web reinforces the foam layers without adding weight; and full-length Brooks DNA protects the foot while providing a customized ride with optimal cushioning. Eco-friendly BioMoGo lends additional support, while the Extended Progressive Diagonal Rollbar (PDRB) creates smooth transitions and contributes to the superior pronation control this shoe is known for. Providing premium wet-dry traction, the Brooks Beast athletic shoe is finished with an outsole that pairs HPR Plus and HPR Green compounds for abrasion-resistant performance and environmentally friendly composition. The Brooks men's Beast Running Shoe and its sister shoe Ariel are running’s leading Control shoes because they deliver the perfect mix of stability and comfort, pampering runners with low or flat arches and excessive pronation. This triumph of technology has been taken to new heights in this update. Now empowered with brand-new, patent pending full-length Brooks DNA, the Beast provides heel-to-toe protection for your foot while dynamically serving up an individually customized ride with optimal cushioning. Get the superior ride you need to keep you running stronger stride after stride. The Brooks® Beast® will keep you comfortably supported and on your feet like a faithful friend. Element upper offers weather resistant protection in a light, ventilated mesh material. Synthetic overlays deliver comfortable, pliable support. Internal support saddle keeps your foot securely locked in. Moisture-managing Element sockliner promotes a cooler, healthier environment. Full-Length BioMoGo midsole provides long lasting cushioning and is environmentally friendly. A non-toxic, natural additive encourages anaerobic microbes to break it down once it's been tossed into the landfill. 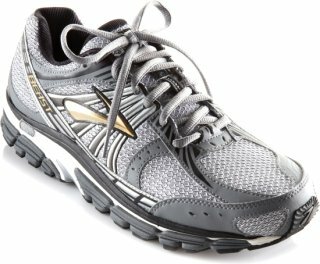 Full-length Brooks DNA works with the BioMoGo to reduce impacting forces and provide superior protection. Progressive Diagonal Rollbar (PDRB®) delivers smoother transitions and promotes pronation control. DRB® ACCEL midfoot shank offers higher stiffness for medial support and lighter lateral stiffness for a smoother ride. HPR Plus, abrasion-resistant rubber outsole is highly durable for long-lasting wear. HPR Green is made from dispersed silica, resulting in optimal wet-dry traction. Brooks Beast - Men's The Brooks Beast combines maximum support and long-lasting cushioning into an adaptable running shoe any self-respecting motion-control freak won't want to live without. Moisture-managing Element™ Mesh upper with synthetic overlay materials. Moisture-managing Element™ linings, internal support saddle. Rearfoot HydroFlow® ST-XL. Forefoot HydroFlow®. Full-length MoGo™, e-2™ rearfoot and forefoot polymer. Extended Progressive Diagonal Rollbar® (PDRB®). DRB™ Accel. Full-length S-257™ cushsole. HPR Plus. HPR Green. Engineered MC pod construction. Ultimate sockliner. Wt. 14.0 oz. The supportive Brooks Beast 12 road-running shoes offer a stable, cushioned platform for runners looking for motion control in an everyday running shoe. Legend has it that Zeus needed a running shoe and thus, the Beast was born. Sturdy and supportive, these leading Control shoes perfect the blend of comfort and stability. The Caterpillar Crash Pad delivers flexibility underfoot without sacrificing assurance, a midsole stability web brings more integrity to the foam on the upper without added weight, and full-length Brooks DNA delivers adaptable cushioning to every unique stride. We also added some slick new styling to make this Beast look fast. Truly the shoe of shoes, the new and improved Beast is simply divine. The Beast has got to be the most comfortable shoe of its type I have ever worn. I needed a shoe for daily walking (about three miles on sidewalks) and for an upcoming trip to Mexico, where I expected irregular cobblestone streets. I have not been disappointed! Support is great, toe room excellent, cushioning superb. I have had other shoes where heel cushion was good but sole not so. The Beast is great all around. Even my size 15s are not what I would call heavy. This shoe is well worth the price. As usual, Zappos customer service was tops, as I needed to exchange an earlier order which did not work out so well for this much better shoe. Turns out I needed a larger size than the 14s I had worn for years. I'm not sure if my feet have flattened out as I have gotten older or if manufacturers have changed their sizing. At any rate, this shoe is a winner for me. Finally, a big guy running shoe. There's a reason why they call it the "Beast" and it's true to its reputation. Highly recommend this shoe for all types who enjoy pounding the pavement/trails. I weigh in at an athletic 265, shoes are of utmost importance when training days involve cardio. I run trails, hills and roads and simply love this shoe. I've finally found the answer, previous expensive sneakers of various brands would quit on me after two months. Felt like the soles would bottom out and lost their POP. Brooks has created a very durable stylish running sneaker that can withstand every stride you take in any terrain. Best shoe for flat feet I've ever wore. I had shin splints pretty bad for a year after a running shoe store put me in a non Brooks Beast shoe and fit me incorrectly for my next shoe. Running in the Brooks Beast allows me to run with absolutely no shin pain. This years model tends to run smaller than a few years ago. 12.5 is my normal running shoe size, but I need a size 13 in this one. These are quality shoes. Very comfortable this particular shoe is made for flatter footed people. If you need the stability it provides and have a medium to high arch get a good insole or arch support. Unlike other brands once you find a size that fits in Brooks shoes that size will continue to fit regardless of the style. I have worn shoes by them for a few years and have not had a reason to look for something else. To date...I have bought three pair of Beast shoes. I can't begin to tell you how much I love them. If you are prone to Over-Pronation, you will thank me for this review. Buy it...you won't regret it. Comfortable shoe with great stability. Great shoe - good fit and comfortable. Brooks should make Beasts from size 12 up with half sizes just the way they do with their Adrenaline shoes.